In support of French operations in the Sahel-Saharan strip, the Reaper drone detachment has just passed the symbolic 20,000 flight hour milestone. 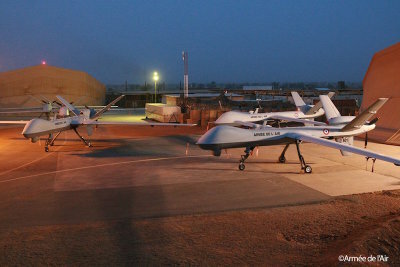 On the proposed Niamey airbase, 25 airmen deploy five Reaper drones. Pilots, sensor operators, tactical coordinators, image operators and mechanics take turns 24 hours a day to provide the necessary information to the various command posts and decision-making authorities to conduct and plan operations. The expertise of the crews and the quality of the sensors make the Reaper system an oft-decisive asset. After several years of sustained increase of this new ISR (intelligence, surveillance & reconnaissance) capability in the Air Force, the Barkhane Force’s drone detachment is today an essential component of France’s military presence in the Sahel. "Given the vastness of the Sahel-Saharan theater, the ISR capacity of the Reaper drones is at the core of aviation operations, and complements other sensors," said the detachment commander. "The valuable information they provide allows for very accurate intelligence and provides a unique capability in the French forces to immediately analyze information. This advantage allows decision-makers to redirect actions in real time. "The Reaper has definitely replaced its predecessor, the Harfang drone, and is now a key and essential part of BSS operations, " he concluded. Deployed since January 2014 in Niamey, the Reaper drone crews reinforce the surveillance, intelligence and intervention capabilities of the Barkhane Force. Led by the French armed forces, in partnership with the G5 Sahel countries, Operation Barkhane was launched on August 1, 2014. It is based on a strategic approach and a partnership with the main countries of the Sahel-Saharan Strip (BSS): Mauritania, Mali, Niger, Chad and Burkina-Faso. It brings together some 4,000 military personnel whose mission is to fight against armed terrorist groups and to support the armed forces of the partner countries so that they can take this threat into account, in particular as part of the joint G5 Sahel force that is being set up.